The Common Fund’s Undiagnosed Diseases Network (UDN) is a research study to improve and accelerate diagnosis of rare and undiagnosed conditions. 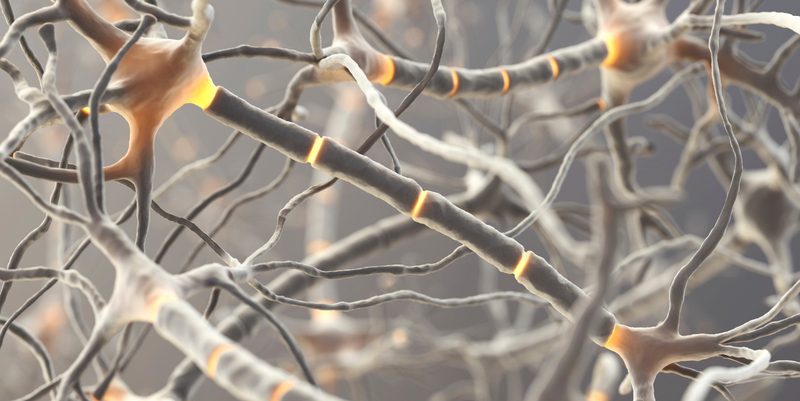 The UDN uses both basic and clinical research to improve the level of diagnosis and uncover the underlying disease mechanisms associated with these conditions. In the United States, it has been estimated that approximately 25 million Americans suffer from a rare disorder. Often times, these individuals go for long periods of time without a diagnosis. To aid these individuals, and to make progress in uncovering, understanding, and treating these disorders, the National Institutes of Health (NIH) established an intramural research program on undiagnosed diseases in 2008, known now as the Undiagnosed Diseases Program (UDP). 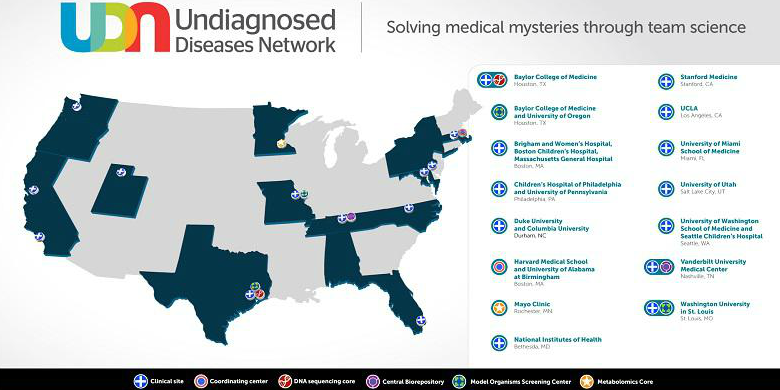 Building on the success of this program in diagnosing both known and new diseases, the Common Fund’s Undiagnosed Diseases Network (UDN) aims to achieve this type of cross-disciplinary approach to disease diagnosis in academic medical centers around the United States. The NIH Common Fund’s Undiagnosed Diseases Network is promoting the use of genomic data in disease diagnosis and engaging basic researchers to elucidate the underlying disease mechanisms so that treatments may be identified. The program is also training clinicians in the use of contemporary genomic approaches to aid in disease diagnosis. 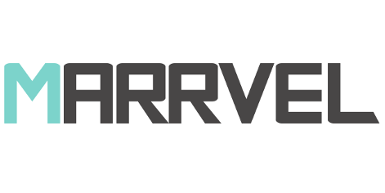 The network also benefits from having the capacity to share data and approaches widely throughout the scientific community. 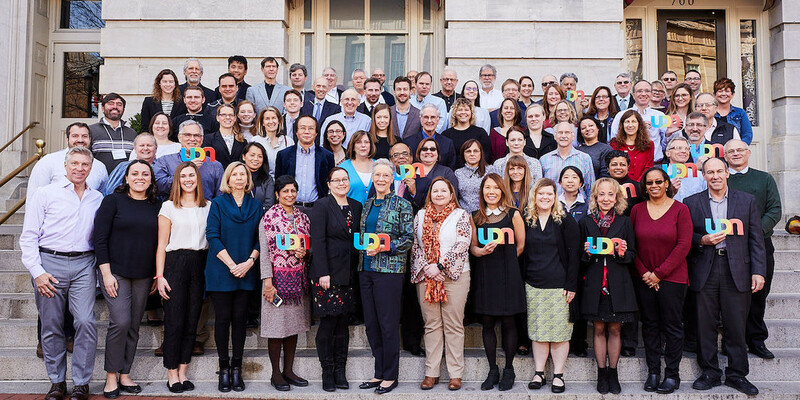 The UDN was launched in 2013 and expanded in 2018. It currently contains the following components. The goal of the Common Fund Program is to form a sustainable national resource to diagnose both rare and new diseases, advance laboratory and clinical research, enhance global coordination and collaboration among laboratory and clinical researchers, and share resulting data and approaches throughout the scientific and clinical communities. 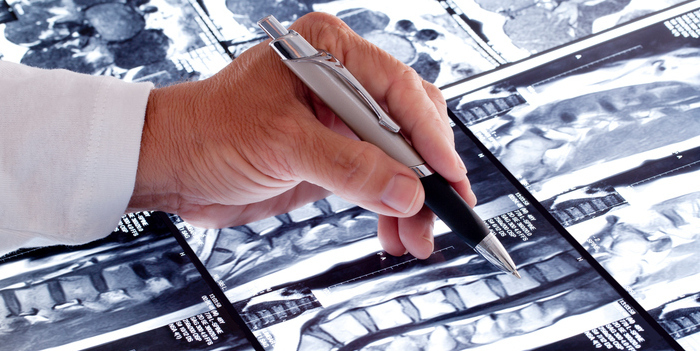 The UDN is a group of clinical and research centers across the United States. More information about the centers that make up the UDN can be found here. Watch the video below to hear UDN researchers describe how they use a team science approach that brings together laboratory researchers and clinicians to solve some of the most difficult medical cases. An audio described version of this video is also available on YouTube. 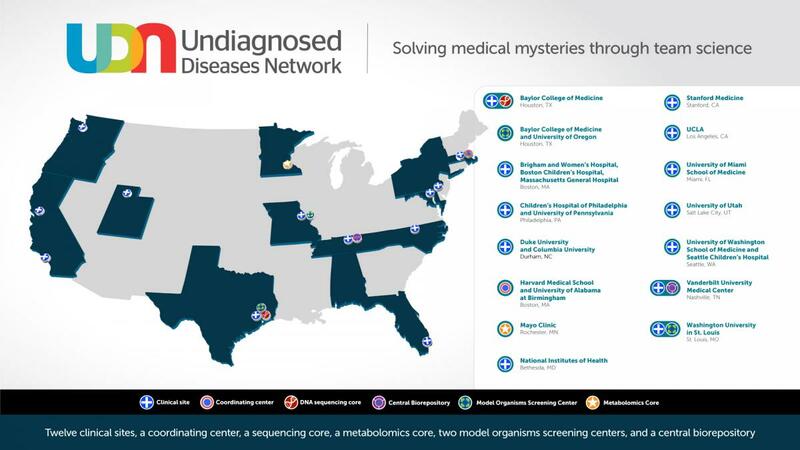 The Undiagnosed Diseases Network: Accelerating Discovery about Health and Disease. The UDN marker paper describing the goals, components, and implementation of the network. The NIH Undiagnosed Diseases Program and Network: Applications to modern medicine. This paper contains numerous examples from the UDP on how investigating undiagnosed individuals advances understanding of a wide range of diseases. Undiagnosed Diseases Network International (UDNI): White paper for global actions to meet patient needs. This paper describes the establishment of the Undiagnosed Diseases Network International (UDNI) which is modeled in part after the NIH UDP. Read for more information about the UDNI. The Undiagnosed Diseases Network of the National Institutes of Health: A National Extension This article in Journal of the American Medical Association (JAMA) describing the formation and the goals of the UDN.